Today we start presenting the interview with Anders Gasendal (AG) and Ricco Krog (RK), for which we asked your participation with questions, sometime ago. Anders is the LEGO Designer behind 8043 Motorized Excavator, the 2010 biggest LEGO Technic set and probably the most awesome Technic flagship, that TLG produced to date. Ricco you also know, he his the LEGO Technic Design Lead. So, here it is the first part of the interview. Hello Anders, this is what we already know about you: You should now be about 30 and been working at TLG since 2006. First in the LEGO Technic design team, but recently you joined the LEGO MINDSTORMS development team. 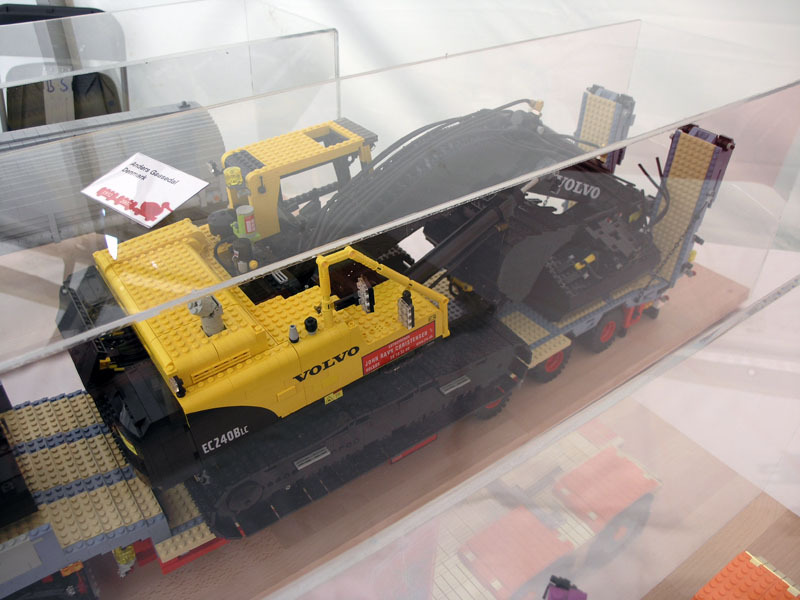 Apart from the large-scale LEGO trucks you built as an AFOL, before joining TLG, you have later created some official Technic sets like the Dirt Bike (8291) and of course the Motorized Excavator (8043). We can only thank you for having created this year’s LEGO Technic flagship model! The expectations around this set have been quite high, and I bet it will remain an icon within the Technic wall of fame, for many, many years to come. As we know, there was a "burn-in" issue with this demanding model, but also here TLG has proven to be capable of a fast and very successful reaction. It definitely strengthens the consumers' confidence in TLG's technical capability to deal with adversities, on the Supply Chain and the Customer Service. This time we decided to run the interview within a different setup. So, instead of TBs' editors preparing all the questions themselves, we also gave the opportunity to the other fans in the community, to contribute with their own questions. The questions were preselected and arranged to make them consistent. This way we aim to give voice to the fan community and at the same time to let you know what they wonder about. We have also reused some of the "standard" questions from the previous year interview with Uwe, as every designer has his own individuality, and thus different opinions and preferences are natural things that also help us understanding the thinking diversity among the Designers team. Some other questions were intentionally left behind, as we plan to include them into a later interview, dedicated to a specific subject somehow related. TBs: How did you come into the great job of being a LEGO Designer? AG: After displaying some of my models at fan exhibitions, I got a phone call from The LEGO® Group. They offered me a two weeks internship in the LEGO® Technic team. It went really well, I had a lot of fun and I was offered a permanent position as a Junior Designer in the team. TBs: Before starting to work at TLG, you were known for your Large Technic Trucks. Therefore it was not a surprise to see you joining the Technic Product Line, once you became a LEGO Designer. One of your last models as an AFOL was a large and awesome remotely controlled Excavator. Why a Motorized Excavator in the 2010 assortment? Is it something you always wanted to do at LEGO and a dream come true? Was it your proposal or was it just an assignment? AG: It’s always a challenge to come up with the new assortment for every year. We do a lot of brainstorms and idea generation on the different models. The flagship is one of the models that are worked on the most, to make sure it’s the most attractive model for all our consumers both kids and adults. We tested a lot of different models and asked a lot of kids which model they fund most attractive, the outcome was Motorized excavator. The model does not only have to be a cool model, it also has to have a lot of exiting functions. The Motorized Excavator has always been a model that we would like to do as a flagship, and when the PF system and the linear actuators were developed, we had the excavator in mind. TBs: I think this was your first Technic flagship. How did you become responsible for designing a flagship, after not so much time in the company? Basically how do you guys decide which Designers develop each model for a season? AG: Since I was the designer that built the very first concept sketch model for this, it was natural for me to be the one responsible for the final model as well. This was a good challenge for me to prove my design skills. Normally it’s quite easy to decide who is developing each model, because each designer often has some personal interests in one or more models. Quite often it’s the same designer that was building the concept model, which ends up building the final model. TBs: The 8043 is quite a complex model! What were the main challenges and compromises you faced while designing it? AG: The main challenge in the model is definitely to make sure that all the complex functions can be built by our target group. It’s not that difficult for us to build complex functions, but making them possible to build for a 12 year old kid, is a challenge that has very high focus. As a designer I also wanted to make it as realistic as possible, so I worked hard to ensure that all the functions did not jeopardize he size/scale relations to the real machines. TBs: This set is probably the largest one built onto a turntable. Also the robust digging arm movements should produce appreciable variations to the position of the model's center of gravity. How did you go about ensuring the excavator was properly balanced? Was it a trial and error process? AG: It was mainly a trial and error process; it’s really hard to calculate these models by formulas beforehand. So during the development of the prototypes it came clear how the motors and battery box should be located to make the balance perfect in the model. Would you like to comment on this small provocation? AG: I’m always trying to come up with ideas for new elements, longer cylinders is of course on my mind. Every year we make a wish list of new elements, but so far the cylinders have not been the element that would give us the most new possibilities. TBs: If we weren't in the Power Functions era, would you have preferred to design an official Excavator model with pneumatic cylinders, instead of motor driven linear actuators? AG: I really like the pneumatic system, it’s very realistic and you can make some fantastic functions with it. For the motorized excavator the Power Function system with the linear actuators fits better though, it gives more accurate control over the different functions. TBs: It was a surprise for the community to know that you left the Technic team to join the MINDSTORMS development. After a complex model like 8043 did you feel there were no more challenges for you with Technic models, or couldn't you resist the call of programmable LEGO toys? What motivates a Technic fan to embrace a different LEGO theme? AG: Having a background as an electronic engineer, I have always seen myself as having two obvious places in the LEGO® Group, in LEGO® Technic and in LEGO® MINDSTORMS. I have always believed in that it’s very important to seek new challenges to develop your skills the most. So when I was offered the challenge to move to LEGO® MINDSTORMS, I took the challenge to try something new. It was not because I didn’t have any more challenges in Technic and someday I might be back in LEGO® Technic. TBs: In his interview Uwe told us, you Designers have a lot of creative freedom and often build concept models that are saved for later use. Guess this might be also your case!? What usually prevents those concepts from becoming official products earlier? Possible element gaps in the system that won't allow for immediate production, or something else? AG: Part of the fun being a LEGO® Technic designer is that I get to build a lot of cool models. Some of these models will never hit the markets as they are either too big, too weird or would demand too many new elements. Some of the models are also saved for later use, simply because we have too many good ideas for a specific launch year. Regarding "each designer often has some personal interests in one or more models." This is quite easy to see when you look at what each designer has come up with in the past. Uwe Wabra has designed several trucks, and Markus Kossman has given us a lot of great construction stuff. Also in the last question, you referred to an interview with Uwe? Do you have a link for it? I had the luck to see the excavator not only working absurd perfect, but also it's internals; Impressive! I've a lot of respect for him, especially since he repaired our van in Skærbæk. By the way: Thanks Conchas for the link to his website; didn't look there for a while. Search for "Uwe" at TBs Google search bar, and you should easily find two links for the interview with Uwe, about his 8258 (Parts I and II). Or just select "TBs TechTalk" on labels and you will also get there with ease. YEEEEEEY, you asked about longer cylinders, YEEEEEY. Thank you very much for asking that. Whilst I can certainly appreciate his responce, I gotta say there are lots of new possibilities with longer cylinders. Anyway it would be much better for the cylinders to be longer, as they are, they are just too short and have to be doubled up in length alot of the time making for an ugly and unrealitstic finish. So it wouldn't really be a new part, but an improvement on an old part, like the new 16t gear. I hope for hydraulics. Yes they would be more expensive, but considering the amount of money many AFOLs spend on Lego (pneumatics and Mindstorms related products in particular) the jump to hydraulics would be feasible IMO. After all, TLG have started marketing some Technic products towards adults, so we'll just have to wait and see what expensive new parts the Technic team produces ;).